It’s time for a double celebration! We are celebrating our first birthday, and a new award we have received – Aurea Innovation Award. Time flies, it seems, especially when you are doing the work you love. The year has passed since we launched OrganicNet and we are pleased to say that the project has received much support from the community and users. When we started working on OrganicNet we could not have imagined the impact it would have. We are thrilled to see that our platform has grown into an idea and initiative that goes beyond just a marketplace for organic food. This was, and still is, our goal. OrganicNet has become an initiative that promotes organic food movement. It has become a pioneer in promoting sustainability, ecology and healthy nutrition. And we are not biased. Awards that we have received speak about our hard work and dedication. 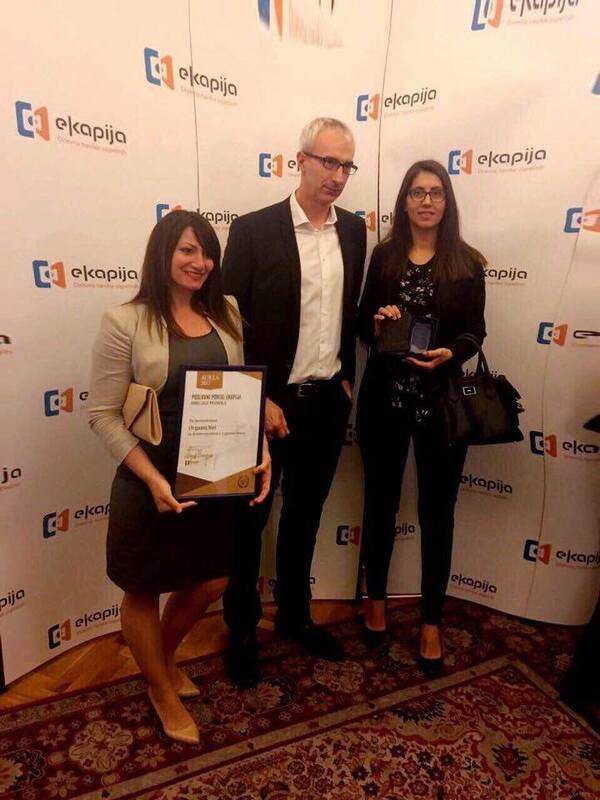 The project received E-COMMERCE AWARD 2016 as the best e-commerce project in Serbia and in the region, and FInish Final Award from the FInish accelerator as one of the best projects within the accelerator. 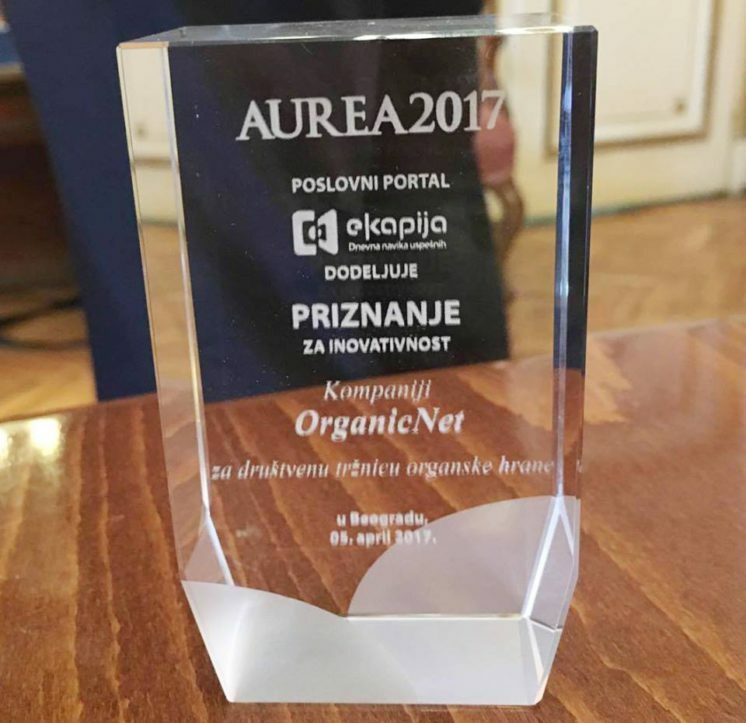 We are excited to inform you that OrganicNet is the winner of another award, Aurea Innovation Award. What is Aurea Innovation Award? The Aurea Innovation Award is given to projects that show innovative thinking that delivers tangible results, drive innovation and make consumers’ lives better. The award competition is organized by the business portal “eKapija“, Serbia’s leading portal that delivers information on relevant business and economic events in the region of Southeast Europe. This year, eight projects have made it to the finals and were assessed based on three criteria: innovation, social impact, and financial potential. A jury of seven, which is comprised of representatives of eminent business organizations and associations, made the final decision, choosing only three projects that are focused on sustainability. (from left to right) Stanislava Stojanović Novoselac, Product Director, Boban Tanović, Founder & CEO and Dragana Grbić, Growth Director. We would like to express our gratitude to everyone who has been supporting us and voted for us. Every award is the confirmation of our work. We are also thankful to organic food producers and consumers who have been supporting our platform since the beginning. Every award we receive helps us do better. From farm to the table – we are making it happen.